Until the present time the only published sources of information about local government in Heaton and its sister townships in the old Parish of Bradford have been William Cudworth's histories.1 Cudworth, however, was plainly an ardent admirer of the progressive and prosperous Bradford Corporation, and his sympathy for a small, impecunious and semi-amateur authority which stood in the way of corporate expansion was scant and patronising. Following the incorporation of Heaton with Bradford in 1882 the records of the Board were transferred to Bradford Town Hall, where I examined them while on demobilisation leave in 1953 and again in 1960. The old minute books, accounts, rate records and sundry papers are still housed in the two tin chests bought for them in 1873. Unfortunately the earliest minute book (1863-1869) is missing, and apart from scattered references in the Bradford newspapers few accounts of the Board's activities during its formative years can be traced. For centuries Heaton had been a rural township of some 1,322 acres situated on hilly ground two miles north-west of Bradford and separated from it by the township of Manningham. Although the incorporation of Bradford, Manningham, Bowling and Horton in 1847 had the effect of bringing the corporate jurisdiction of the new municipal borough to the southern boundary of sleepy Heaton, it made no immediate impact on the farming and quarrying community 'north of the border', which pursued a very different life from that of the masses engaged in the bustling, energetic, workaday existence or smoky Worstedopolis. Even the prevailing Pennine breezes tactfully wafted the soot and the grime of Bradford's chimneys away from the woods and pastures of its rustic neighbour. It has been said that cholera brought about the introduction of modern forms of local government in England. The epidemics which ravaged Europe in the years following the Napoleonic Wars had a dreadful effect upon the rapidly growing, unplanned and insanitary towns of the Industrial Revolution, and the Municipal Corporations Act (1835) and the Public Health Act (1848) were intended as a means of preventing such disasters. But although Shipley in the year of the launching of its famous suburb, Saltaire, was permitted to adopt the 1848 Act and set up a Local Board - Haworth was compelled to form one when a Government Inspector declared it to be a dangerously unhealthy place - smaller, semi-isolated communities were not encouraged to follow their example. In 1858 a further Public Health Act was placed on the Statute Book. Like its predecessor it was adoptive, not obligatory, but it contained a clause. which apparently attracted the attention of John Binns Hammond, the elected churchwarden of Heaton. The offending clause made it possible for townships with a population less than 3,000 to be compulsorily amalgamated with one of their neighbours. The prospect of undergoing unwanted amalgamation with either Shipley or Allerton, with the ever-present fear of higher rates for other people's benefit, was clearly not be be borne. And human nature being what it is, J.B. Hammond, a somewhat fiery character, may have been attracted by the possibility of enhanced personal status as a member of a Local Board. Accordingly, in or about May 1863, he persuaded twenty ratepayers to sign a requisition under the 1858 Act summoning a Town's Meeting for the purpose of adopting the Act. Those present at the meeting resolved to petition the Home Secretary for a Local Board, and the necessary permission was duly published in the London Gazette on 14 August. The Overseer of Heaton, as Summoning Officer, thereupon called for nominations for the six places on the new authority. (vii) cleansing of footways, privies, cesspools and ashpits. The officers of the Board - Clerk, Treasurer, Rate Collector and Surveyor - were appointed at an early date. Mr J.J. Hill, a Bradford solicitor, was appointed Clerk on a part-time basis and his duties included the preparation of rate estimates for the Board's approval. The rate collector (for many years R.B. Weale) received an 'incentive bonus' of 2½% commission on whatever sums he could induce the reluctant ratepayers to part with. Finances were in the hands of the Treasurer, but the name of the original holder of this post is not known. The Surveyor, Robert Isles, was a well-known local character, having previously served in that capacity under the auspices of the Town's Meeting or Vestry. * The rate was 10d in the £ on property assessable for the Highway Rate, based on a Rateable Value of £5,431 19s. 4d. Equivalent local figures were: Baildon £1,757 and Shipley £7,289. It is clear that the six members of the Board, as they congregated in the tiny vestry for their monthly meeting with their part-time Clerk, intended to carry on the age-old tradition of laissez-faire or minimum interference, as the first two meetings of which a full record exists were summoned for the sole purpose of approving Accounts and cheques. Slowly and imperceptibly however, the pace of life began to increase. Planning applications for new developments Were received with greater regularity - a new school in Church Lane and houses in Heights Lane and Quarry Street (1870): houses in Woodville Place for the West Bank Building Club (1873); a few villas in Park Drive and a new Independent College designed by Lockwood and Mawson (1873), and 32 semi-detached villas at Heaton Grove and a railway station at Frizinghall (1875) being typical samples. Significantly, it was the opening of the railway station at the eastern extremity of the township that influenced the destinies of the Local Board more than any other single event, as it placed a hitherto rural hamlet within easy reach of Bradford, whose affluent businessmen welcomed the opportunity of dwelling beyond the limits of industrial grime and Borough rates. Unfortunately several of the 'immigrants' were loth to dispense with the urban amenities to which they had been accustomed, and agitation was aroused for better roads, better lighting and representation on the Board. Gradually, as demand increased and finances permitted, improvement schemes were put into operation. The more modest plans were rate-borne but major schemes were financed by loans from the Public Works Loans Commissioners and the East Morley Savings Bank. A modest scheme of street lighting was embarked upon in 1870, using gas supplied by the Shipley Gas Light Co., and the Clayton, Allerton and Thornton Gas Co. The original seven lamps were lighted during the winter season only, and when not in use the lanterns were taken down and 'deposited with James Dunn the lamplighter'. Within twelve years, however, the highways and byways were illuminated by a maximum of 97 lamps. Highways were a constant source of concern and expense; indeed, until 1876 they merited a separate rate which rose steeply from 6d. in the £ in 1871 to 4s. in the following year, by which time extensive road-widening schemes were in operation. The water-bound limestone road surfaces suffered severe wear from horses' hooves and iron-bound cart wheels, and over-zealous quarry-owners had a disconcerting habit of mining beneath the main roads. The leading or cartage of road materials was put out to tender among the local farmers, Acquilla Greenwood receiving 10s. per ton of 22cwts. for leading limestone to Dumb Mill Staith from the canal bridge at Frizinghall. The Board's own employees were generally considered incompetent. In January 1878, they were reprimanded for 'unseemly conduct' towards passers-by, and in December the Surveyor was lectured upon 'the enormous cost of repairing the Board's roads and the small amount of work obtained from the the roadmen for the wages paid them'. Great emphasis was laid on the necessity for sewerage, sanitation and hygiene - understandably so in an age in which diphtheria, consumption and varieties of fever were dangerously prevalent. Property owners were regularly reminded that cleanliness was next to godliness,3 and in 1873 Dr. Cogan of Allerton was appointed part-time Medical Officer of Health at £20 per annum. Sewers were constructed from Heaton village to the Bradford Beck at Frizinghall, but for many years cesspools continued to be a necessity of life in the outlying parts of the township. Less successful were the plans to provide a piped water supply to every house. Some years prior to the formation of the Board the Bradford Corporation had secured a monopoly of water supplies and had constructed two large reservoir systems at Chellow Dene and Heaton Syke, both of which lay outside the township boundary. Under the terms of the monopoly the only water which the Board could sell to its own ratepayers was water bought from the Corporation, who fixed the charges. Supplies could be gathered from local streams and quarries, but had to be distributed free of charge, and the purity of the water was often in doubt as a result of the manuring of the fields and the working of the quarries. "on account of the unfinished state of the pipes, when the reservoir was tested and the water let out, it flowed all over the surface of Daisy Hill Lane4 and eventually got into the cellars of the houses at West View, the owners of which houses made great complaint thereof." Nevertheless, an adequate supply was now available for Heaton village, while Sandy Lane Bottom (somewhat indifferently) and Frizinghall, were fed directly from the Bradford mains via meters on the township boundary. The total cost of these improvements was £9,256. As the Board's public duties became more onerous its meetings became lengthier and more frequent. The membership was increased to seven in 1872 and to nine in 1876, committees being formed for Finance and General Purpose; Streets, Drainage and Buildings; and Waterworks, Gas and Nuisances. Having outgrown the Vestry, the Board hired accommodation at the Baptist Sunday School from about 1872. 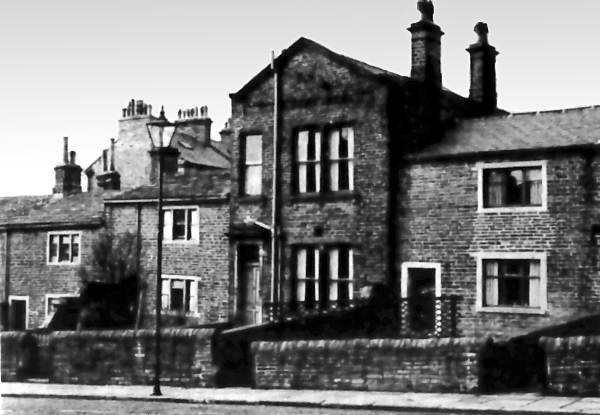 Finally, at the meeting held in April 1876, following animated discussion about Nancy Lambert's lead piping, Murgatroyd's pig sty, Wadsworth's drain, improvements to the railway bridge and the iniquitous charges of the Shipley Gas Co., the Board agreed to buy James Briggs's cottage at 55 Highgate, Paradise, for not more than £150, plus 30s. for tenant's fittings. In a modest display of civic pride the cottage was demolished and replaced by lofty offices bearing the proud inscription, '1876 - HEATON LOCAL BOARD'. Friction with Bradford Corporation occurred from time to time. In view of its known expansionist policies and its water monopoly this was to be expected. In addition, a small portion of Lister Park, recently purchased by the Corporation, lay within the township, and when the Corporation constructed a large ornamental lake within the park they made use of a somewhat polluted rivulet which flowed down from Heaton - and then complained of the consequent pollution of the lake. Illogically, towards the end of the decade there arose in Frizinghall a small but vociferous faction of residents who had removed from Bradford to escape the Borough rates, but who nevertheless expected to receive the same level of public services from Heaton's much more slender resources. Despite repeated attempts they did not secure representation on the Board until March 1880, when the proximity of a General Election sharpened animosities: G.H. Rushworth and William Gilyard succeeded in displacing two long-serving old inhabitants, and thereupon events moved swiftly. Within a few weeks the Board received a petition from forty Frizinghall residents requesting them to hold a town's meeting for the discussion of the question of incorporation with Bradford. As the petition could not lawfully be ignored, the Chairman of the Board was obliged to arrange a meeting of owners and ratepayers in the Baptist schoolroom on 22 June 1880, and those who attended the meeting decided to authorize the Board to explore the possibility of amalgamation. Ironically, although Messrs. Rushworth and Gilyard welcomed the idea of an extension of Bradford into Heaton, their welcome for the industry which could be expected to follow it was less enthusiastic, and when a plan was announced for the erection of a dyeworks at the top of Airevi1le Road they busied themselves with another petition. However, the project was abandoned, leaving them free once again to find fault with the Board's actions and dissent from its resolutions, which they did with great frequency. When the Board decided that a poll should be held to resolve the amalgamation question, the township was deluged with petitions and counterpetitions. Supporters of the proposal laid stress on the possible expense of future improvements to Heaton, and the danger that the township might be served with an injunction in respect of sewage discharged into the Bradford Beck. A School Board would also be needed, and Bradford could provide better services and cheaper water. Opponents warned of the arbitrary and ever-changing Bradford bye-laws, of the increased valuation of property and the loss of individuality which would follow upon incorporation. The Board thereupon opened negotiations with the Corporation, who made application to Parliament for a Waterworks and Improvements Bill, which received the Royal Assent on 18 July 1881. The final meeting of the Board took place on 29 April 1882, and the amalgamation took effect two days later. 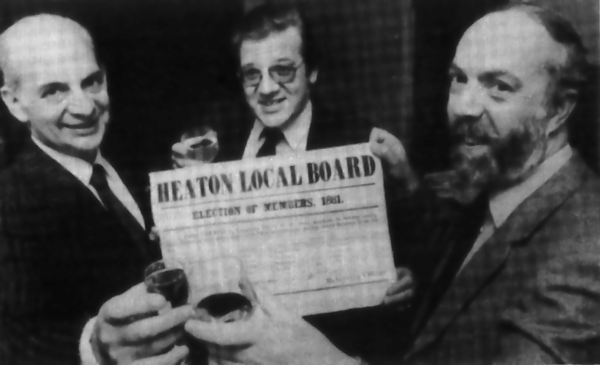 Heaton Local Board - centenary of dissolution, 30 April 1982. Councillor JS King is on the right. Several of the Board - John Crabtree, Heber Duckworth, John Greenwood, Charles Sowden, W.H. Townend and J. Lee - became borough councillors, and as the Corporation gradually took control, memories of the Heaton Board began to fade.6 The offices, later used as a police station, are today a private dwelling, and the not-altogether-successful reservoir now serves a rifle range. In conclusion it can be said that although the Board's resources and its scale of activities were modest and unremarkable when compared with those of the Corporation, it nevertheless served the needs of the time, and for the most part gave satisfaction to the ratepayers. Few local authorities would expect a better epitaph.